Etisalat Lanka together with Cargills Food City recently concluded their seasonal promotion. 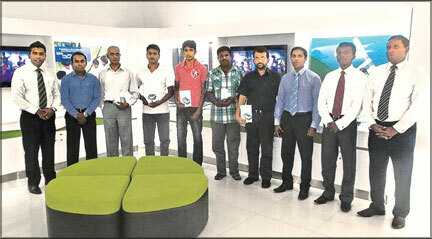 The winners from this promotion were rewarded recently at the Etisalat Colombo Flagship Store where the weekly winners walked away with a Samsung Galaxy Tab 2 and the grand prize being an iPhone 5. Etisalat Lanka representatives and Cargills Food City representatives with the winners, left to right, Etisalat Lanka, Head of Prepaid and Brand Marketing, Shameel Bishri, Etisalat Lanka, Assistant Brand Manager Prepaid Marketing, Ruwan Gamage, Weekly Prize Winner 1, Ramasamy Doresamy, Weekly Prize Winner 2, N. Palitha Chandrasekara, Weekly Prize Winner 3, M. Harshan, Grand Prize Winner, Nadarajah Jeyakanth, Weekly Prize Winner 4, A. A. S. Chandrajayantha, Cargills Food City, Deputy General Manager, Retail Marketing, Sanjeewa Fernando Cargills Food City, Retail Brand Manager, Raj Asirvatham and Cargills Food City, Assistant Retail Brand Manager, Haritha Indeepa.